In life, there are times when negativity seems to surround us, smothering our dreams and destroying our hope. But if we become more observant, we will see that the present moment is filled with a lot of beauty. We can either allow this negativity to saturate us, and hold us back, or we can let our positive attitude propel us forward. When we allow negativity to suffocate our dreams, we start to accept it as a way of life. It is very true that we cannot control what happens to us, but we certainly can control how you react to it. If we take a moment and think about the things around us, how do we perceive them? Do they provide a delightful experience every day? Our partner comforting us, a neighbor helping us start our car, or offering to ride us to work. Perhaps someone bring us a sumptuous dinner, how do we feel, how do we respond? A positive attitude toward the thing happening to us, or being done to us, can shift our entire life. If we infuse our minds that good things are happening to us every moment of our lives, then we will became tremendously motivated to achieve our goals and dreams. When facing an annoying situation, look for a positive benefit, and learn from it. Do not get irritated by the sun, but enjoy its warmth. When you see snow, view it as a beautiful panorama. See good in each day, find the positive side in each moment, and in every experience. Strive to notice and appreciate all the good that comes your way, every day of your lives. Open your eyes and your soul and see all the good thing around you, remember life proceeds the way you allow it to proceed. There are beautiful things to be seen in every imaginable direction, but you have to be willing to see them, and help create them. 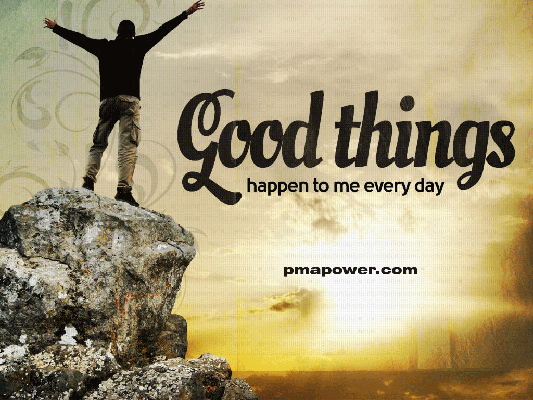 Good things happen to me every day! In life, there are times when negativity seems to surround us, smothering our dreams and destroying our hope. But if we become more observant, we will see that the present moment is filled with a lot of beauty. We can either allow this negativity to saturate us, and hold us back, or we can let our positive attitude propel us forward. When we allow negativity to suffocate our dreams, we start to accept it as a way of life. It is very true that we cannot control what happens to us, but we certainly can control how you react to it.